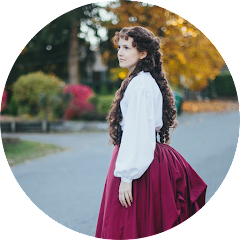 Since making my first 1840's dress over a year ago, I have been dying to make another. I'm naturally more drawn to the simpler, "every day" wear, if you will, and I'm stepping outside my comfort zone by working on something more elegant. 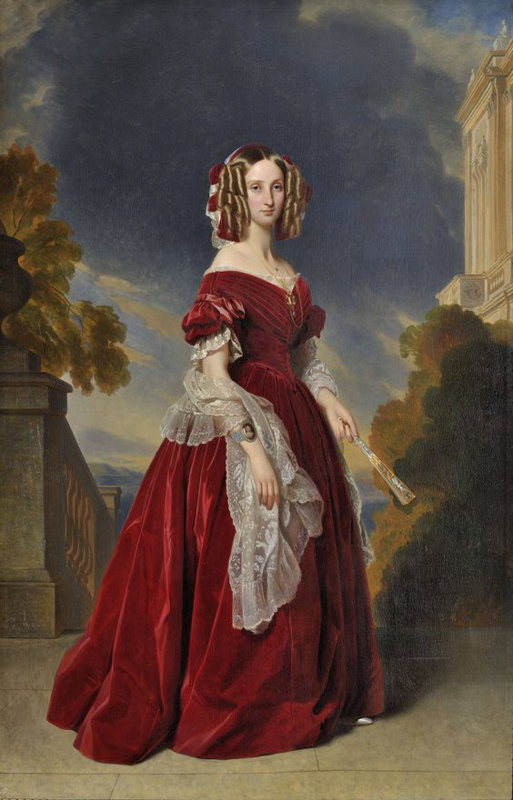 I came across this beautiful portrait of Queen Marie-Louise of Belgium from 1841, and I fell in love. 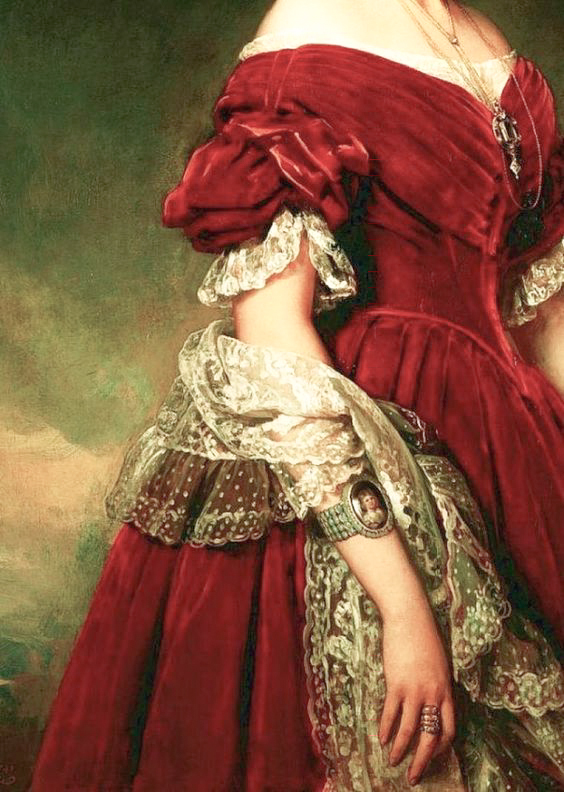 Not only does it capture the very essence of 1840's fashion with just a hint of the 1830's in the hair, it's also red and I recently got it into my head that I want to make a red dress (for no reason in particular). Today I'm sharing my inspiration and the beginning of my research for the gown. The painting itself was painted by Franz Xaver Winterhalter in 1841. Winterhalter was a well known artist of the 19th century, and painted portraits for royalty all over the world. Perhaps his most famous portrait is of Empress Sisi of Austria. It looks to me as if the dress is made of velvet, however I've decided to make it from a faux silk I got a good deal on from Bankok Thai Silks. I would use 100% silk fabric, but unfortunately my budget isn't quite there at the moment. The dress has the typical shape of the period with a full pleated skirt, pointed bodice, and pleated bertha with puffed sleeves. It's accessorized with a lace tucker, jewelery, and a lace shawl and headpiece. I'm planning on doing more of an interpretation of the gown rather than an exact replica, so I may play around with the accessories and hair a little. As for patterns, I'm drafting everything myself using patterns from Patterns of Fashion I and Period Costume for the Stage and Screen as references. I've found a couple of patterns in each that I think will work perfectly. I'll be posting more about this dress soon.